The Endurance collection of composite doors offers you the complete freedom to make an impression, leaving nothing to be desired when it comes to finding a stunning new addition for your property. The Urban Collection, characterised by its stunning modern flair, features a selection of 10 stylish designs for you to choose from: opening the door to a stand out statement. An example of one of these options is shown via this stunning installation, a dual composite door fitted with chrome pull handles and hardware. 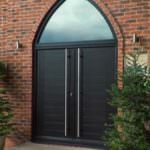 The Mayon design, a unique door style, is the ideal option for homeowners looking for something a bit different. The solid panel acts as the perfect canvas for bringing a striking design that is suited for modern and traditional homes alike. Without a glazed section, the Mayon door will allow you to make the most of our colour selection. Whether you’re after something sleek and stylish, like the Anthracite Grey used in this installation, or something homelier and comforting like a Rich Red or Racing Green, the choice is yours. Our Homeview Door Designer is the ideal way for you to see the best colour for your home. The Urban collection can also be fitted in dual colour design, offering a different colour on the interior and exterior of the door. This is perfect for making sure your new door simultaneously matches the façade and interior décor of your home. This installation made use of dual colouring by having a crisp white interior, seamlessly complementing the inside of the building. Although inherently modern, the Urban Collection offers something for modern and traditional homes alike. 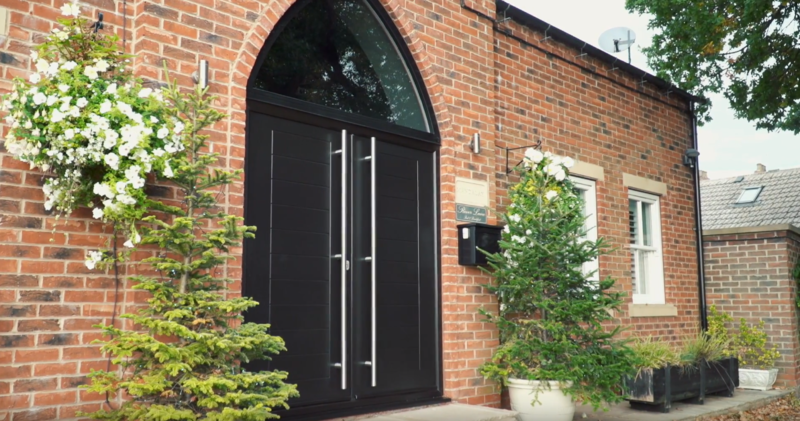 This Mayon door was fitted onto a converted church building, making use of the building’s traditional appeal to emphasise the modern flair that the door was bringing. The shiplap styling and impressive pull handles work to maintain a sense of towering grandeur. 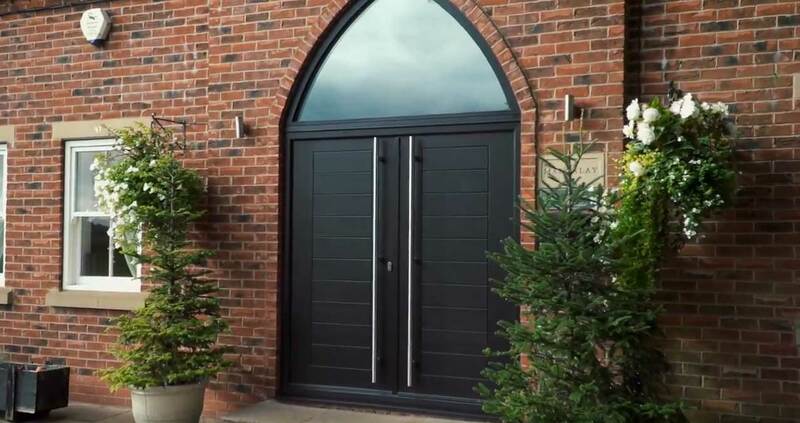 These doors are the ideal way to bring an updated touch to a traditional build, or a suitable fit for a cutting-edge new build. Their versatility means that you won’t have to worry about missing out on the quality on offer, no matter what property you have. To make things even easier, we also offer a wide selection of colour and hardware options too. Getting a stand out statement for your home requires more than just a standard combination of features, it requires something personal that is really going to echo your personality. 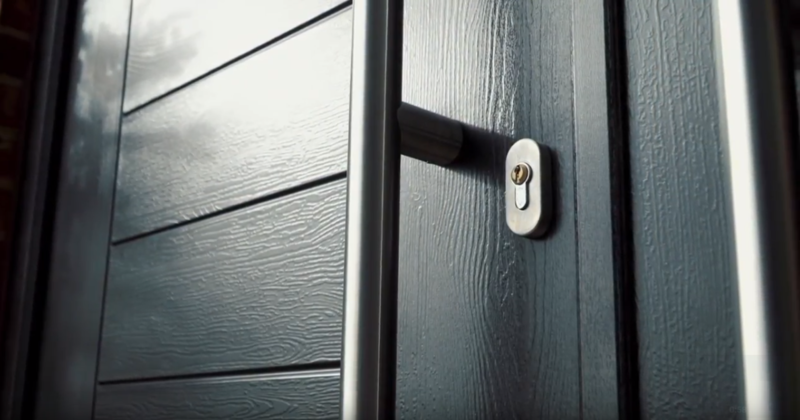 To help you do this, the composite doors from our Urban Collection can be complemented by a selection of hardware options: bringing the best in function and form. This includes letter plates, lever handles, lever pad handles, pull handles, knockers, locks, and pull knobs: all available in Chrome, Graphite, Gold, Bronze, Black, Antique Black, and White. Each one of these colours works better with different colours, so visit our HomeView Door Designer to experiment with different combinations from the comfort of your own home. Alongside the Mayon, the Urban collection also features nine other door styles. These are the Abbot, Alto, Calva, Fuji, Gibson, Hallin, Kentmere, Nab, and Starling. Visit our Urban Collection page to see each one of these styles, with a brief description of what makes them special. With such a wide range on offer, you’re sure to find the right one for you. These doors all feature different glazing placements, which enable for differing degrees of natural light allowance and privacy. To bring a beautiful final touch, you can choose from a selection of stunning glazing options too. Whether you’re looking for something decorative, or something that is going to make you feel more comfortable in you’re home, we’ll have something to suit. Why not get in touch with us today, or visit our Homeview Door Designer to help you get the right stand out statement for your home. We’ll be more than happy to answer any questions that you may have, or you can use our innovative online tool to see how your new door will look on your home. It’s never been easier!